When my friend Heather asked me many moons ago whether we would like to go on holiday with her family at the February half term, we jumped at the chance. It was a great excuse for a get together and a chance for everyone to relax… well, clearly not the kids who had more energy than I have ever seen before! The Location… SkegVegas… or Skegness, if you aren’t quite down with it. Skoda had very kindly loaned me a car for the week in order to travel down to SkegVegas with Mini Me in style and we are very grateful as it was super economical and I never had to fill up the car once on a 300 mile round trip. In fact there was still over a 1/4 of a tank left on our return… unheard of with my car! 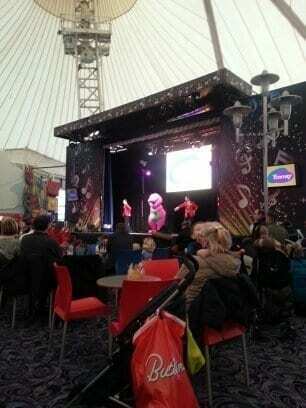 So… Butlins… what did I think? Well… Mini Me loved it. As a child she would, there was so much chaos and noise and things going on for the kids not to enjoy themselves. As adults, the main pull was the pub for sure. I can hold my hands up and say I tried it, but can wholeheartedly say it isn’t for me. My Dad upon my return blamed himself and mum for spoiling me when I was younger! We stayed in the Gold Apartments, which were actually quite nice. Set quite away from the hustle and bustle, we certainly worked off our pint calories walking around! With a double bedroom and two singles there was plenty of room for the three adults and three children. The kitchen had everything we need… included a broken glass that sliced my finger open whilst washing up. It was reported as an accident, yet it was never followed up by Butlins. I’m just glad it was myself and not one of the children that dealt with the glass! We only found out on our second to last day that the room attendants actually wash the pots for us. It could have saved so much hassle and having my finger sliced open on a glass that Butlins had provided… already with a chip in it! The amusements were ok, the fairground was cool but the queuing was a pain, especially when still under the influence of the amber nectar! It just seemed like you had to pay for everything and what made it worse was the fact we were a captive audience. Escaping to Lidl in Skegness (3 miles away from Butlins) was great to stock up on food and drink and for a little bit of normality. Never go on a fast ride, the night after living it up on drink! We went to the opening evening of the Scooby Doo show – after having an early dinner, assuming that an hour was enough to leave for queuing… we found out how wrong we were when we took up our position, outside the Pavilion, almost back at the pub. This resulted in there not being any seats for us or the children and us having to camp out on the floor so we didn’t actually see the show… though we heard it. I would suggest a good hour and a half for queuing time if you plan to see a show! Monday – Friday was certainly enough and Liv and I were long gone on our way home before the 10am kick out. There are plenty of places to eat, I would recommend the Fish and Chip shop in the Pavilion. The food in the pub was terrible for the price, however the drinks were awesome! It was great, just not for me personally – for kids it’s great but be prepared to spend some cash whilst you are there! wow doesn’t sound great, what a shame about the glass! yeah, i haven’t written my review yet. i’m deliberating the wording. I don’t think i’ve ever been forced to sit on the floor at a show before. Weird times. Yeah… I didn’t even have to write about it but felt I needed to publish something. It just wasn’t my type of place. Accommodation was great – just wish it had been somewhere else!